The U.S. 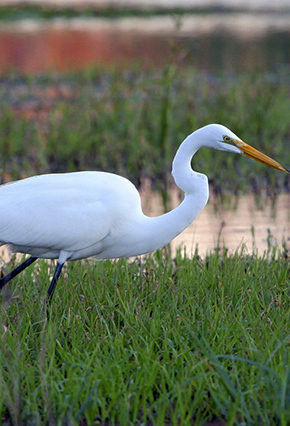 Fish and Wildlife Service (“USFWS”) has announced that it is taking early steps to develop a regulatory framework that would authorize the incidental take of migratory birds under the Migratory Bird Treaty Act (“MBTA”). On May 26, 2015, USFWS issued a notice of intent (“NOI”) to undertake a programmatic environmental review under the National Environmental Policy Act (“NEPA”) to consider the potential environmental impacts associated with a possible permitting regime for incidental take under the MBTA. As part of this process, USFWS has proposed a slate of options to be considered, including: (1) general incidental take authorizations; (2) individual incidental take permits; (3) memoranda of understanding (“MOU”) with other federal agencies; and (4) voluntary guidance. While the ability to obtain incidental take authorization under the MBTA could provide a needed measure of certainty for entities and individuals who engage in activities that may impact migratory birds, such a permitting regime can be expected to involve the imposition of conditions, mitigation requirements, and other potential restrictions on resource use activities deemed necessary to avoid or minimize the effects of “take” of migratory birds. These measures have the potential to narrow the scope of resource development activities, increase costs, and impose additional time delays in obtaining federal permits or authorizations. USFWS is soliciting comments on a wide range of issues, and engagement early in the process will allow interested stakeholders to provide valuable input into the scope and details of any incidental take permitting framework. The deadline for public comments has been set for July 27, 2015. Four public scoping meetings will be held from mid-June to early July. The MBTA currently applies to nearly all native bird species found in the United States (more than one-thousand species). Pursuant to the statute, it is unlawful to “take”—i.e., “pursue, hunt, shoot, wound, kill, trap, capture, or collect or attempt to pursue, hunt, shoot, wound, kill, trap, capture, or collect”—protected migratory bird species unless and except as authorized by regulation. The MBTA is a strict liability statute, and violations of the MBTA are potentially subject to criminal penalties and enforcement actions. Historically, USFWS has exercised a significant amount of prosecutorial discretion in determining whether to pursue criminal penalties for “take” under the MBTA. This exercise of prosecutorial discretion recently has come under criticism based on claims that USFWS has selectively targeted certain industry sectors, such as oil and gas production and transmission, while mostly disregarding “take” resulting from the operation of wind and solar energy installations. Implementation of the MBTA is made more difficult by the absence of an effective regulatory scheme for seeking incidental take authorization. Other statues, such as the Endangered Species Act and Marine Mammal Protection Act, have regulatory programs by which entities can obtain authorization for activities that may incidentally “take” a protected species. This potential for regulatory certainty is currently absent under the MBTA. (1) General Incidental Take Authorizations. USFWS would develop a “general conditional authorization” for incidental take of birds by certain hazards associated with particular industry sectors. USFWS specifically identifies: (a) oil, gas, and wastewater disposal pits; (b) methane or other gas burner pipes at oil production sites; (c) communication towers; and (d) electric transmission and distribution lines. In addition, USFWS has indicated that it may seek to develop additional measures for other industry sectors, such as for wind energy generation. (2) Individual Incidental Take Permits. USFWS would establish individual incidental take permits for projects or activities not covered under the general authorizations. These individual permits could cover activities or siting decisions that require project-specific considerations or have limited information regarding adverse effects. (3) MOUs with other Federal Agencies. USFWS would consider expanding existing MOUs and negotiating MOUs with other Federal agencies to authorize incidental take if impacts to migratory birds by the agencies or third parties are considered and appropriately mitigated. These MOUs could potentially provide a vehicle to authorize take by regulated third party entities. (4) Voluntary Guidance. USFWS would evaluate an approach that expands upon its existing efforts to develop voluntary guidance for specific industries and sectors. With the NOI, USFWS seeks specific comments on a number of issues, including: (1) the approaches to consider for authorizing incidental take; (2) specific types of hazards to birds associated with particular industry sectors that could be covered under general permits; (3) potential approaches to mitigate and compensate for the take of migratory birds; and (4) the potential costs to comply with the actions under consideration, including those borne by the Federal government and private sector. Whatever regulatory approach USFWS settles on has the potential to significantly affect a broad range of industries and sectors. Accordingly, potentially affected parties should take significant interest in the agency’s NEPA process and consider commenting on the NOI. Comments in response to the NOI are due by July 27, 2015. Van Ness Feldman LLP is available to assist interested stakeholders who wish to comment on the NOI. If you have any questions on the NOI, please contact Jonathan Simon, Joseph Nelson, Tyson Kade, R. Scott Nuzum, or anyone else in our Natural Resources Practice Group.